Definition: Good body language is the act of making a positive impression in the minds of others by the proper use of your appearance, dress-code and gestures. Posture relates to how you stand or sit. Do you stand up straight, or do you tend to slouch? Do you sit up straight, or do you lean? The posture of good body language implies standing or sitting up straight. Appearance relates to your clothing and your grooming. Do you tend to dress smarter or scruffier than other people who are in the same room? Do you tend to have better grooming, or worse grooming? Good body language implies dressing slightly smarter, than others in the same room and being well groomed. Touch means how much and in what ways you come into physical contact with others during normal conversations. This includes the quality of your handshake, which should be firm. Some people are very tactile and like to hug and hold others. Some people don't like to be touched. Good body language implies being sensitive to other peoples need to be touched, or left alone. This relates to how you use your arms and hands, as you speak. Some people use their hand and arm gestures in ways that help them communicate a positive message. Other people use their gestures to cause trouble. 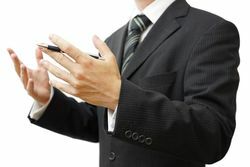 Good body language implies using your hand and arm gestures to support your message, not to detract from it. Orientation is about the angle at which you stand relative to the other person as you speak. Some people stand square-on, and most people stand at a slight angle, so that they lead with one shoulder. A square-on orientation has a higher intensity of emotion than an angled orientation. Good body language implies avoiding a square-on orientation, unless you intend to come on strong. This is about how you use your face. Some people have a pleasant facial expression and seem genuinely happy to see you. Other people look grumpy and seem always to be down in the dumps. What expression is your standard setting? Good body language implies that a relaxed, friendly facial expression should be your standard setting. Good body language implies having a nice scent. Accessories are the tools you carry with you. Your computer, your car, your tools. Are your accessories clean and kept in good order or is everything you own dirty, damaged and looking a bit tatty? Good body language implies have your kit in good order. This relates to how far away, or how closely you stand, or sit, relative to the other person. Some people like to get close. Sometimes too close. Other people like to keep their distance. Good body language implies keeping about one arms distance from others. This relates to the degree to which you hold the other person's eye contact as you talk to them. Some people look into your eyes, as they speak. Others avoid giving eye contact. Others flip it on and off. Good body language implies giving good eye contact and then responding to the other person's reaction and matching their response. Cicero said, "The eyes are the windows to the soul". Check yourself against the above ten factors and make the necessary adjustments to improve your body language. Good body language is a key communication skill which we cover in our one-day Communication Skills Training Course.